Providing public insurance adjuster services to Isle of Palms, SC homeowners and businesses with hurricane, flood, storm surge, and wind damage. Call 800-654-3041 for free claims evaluation. Due to excessive volume of Hurricane Florence insurance claims Global Patriot Adjusters is handling, we are NOT able to serve South Carolina residents at this time. Should this change we will post an update to this page. Sorry for the inconvenience this may have caused. Specializing in hurricane damage, flood, storm surge, and wind damage insurance claims — we can help. 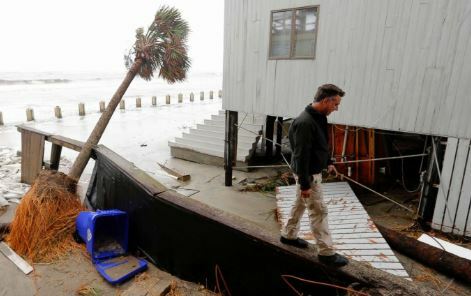 Isle of Palms, SC hurricane wind damage insurance claim. Please call Marc Lancaric at 800-654-3041 with any questions about our South Carolina insurance adjusting services. Isle of Palms, SC is a city in Charleston County, South Carolina, United States. At the 2010 census, the population was 4,133. Isle of Palms is a barrier island on the South Carolina coast. The city is included within the Charleston-North Charleston-Summerville metropolitan area and the Charleston-North Charleston Urbanized Area. The town lies along a narrow strip of land, hugging the beach, separated from the mainland by the Intracoastal Waterway. It is an affluent community of both vacation home owners and year-round residents, with large beachfront homes, resorts, and local restaurants. Beach volleyball is popular in the summer, and the "Windjammer" club hosts several tournaments throughout the year.